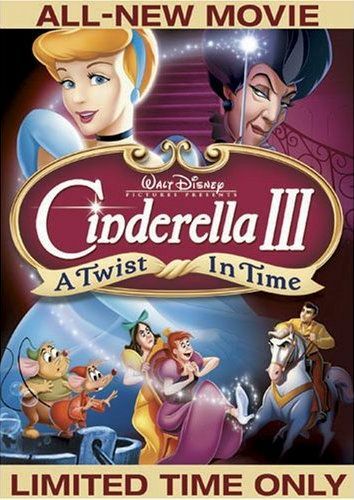 Cinderella III: A Twist In Time... wow, I never even knew there was a Cinderella II. Hold on a sec, I'm gonna go check this out... okay, so it seems Cinderella II is actually a collection of three short stories, not a full length feature. Well, Cinderella III is back to the feature length animated story, though despite the quote on the front of the DVD case by Bryan Erdy of NBC-TV which says "just as magical as the original", this film fall far short of being on the level of the original. Unless what he meant by that quote was that more magic was used during the story than in the original, in which case that might be true. You see, in this story, that evil wicked stepmother of Cinderella's gets a hold of the Fairy Godmother's wand, which she can then use to do almost anything she wants. Apparently magic wands are just point and click. True, it requires a password to use, but when you have to say the password out loud it kind of defeats the purpose. And with something that powerful, wouldn't you think that it should be kept away safe, only to be brought out and used for important occasions? So why did our blue-cloaked grandma bring it out to help give Cinderella and the Prince a magical picnic? The two were in love, they were happy, just going out for a nice normal picnic. There was absolutely no need for the magic wand! So oops, I dropped it... and now the wicked old bag's got it! So what does wicked grandma do with the wand-that-can-do-anything... hold on a sec, in the first film it stopped working midnight, so was that an artificial limit imposed by Fairy Godmother or a limitation of the wand? Because I never saw any kind of time limit in this movie. I guess the wand could have been upgraded.... Anyway, so back to wicked stepmother. She takes the wand and magically transports everyone back in time, to just before the dude comes to the door checking if the slipper fits. I don't know why she chose that, 'cause if I was an evil dude with an ambition for power and status, I'd just make myself king or something. Seems a lot easier than trying to get your clumsy daughter to woo a prince. But no, wicked stepmother then uses magic to make the glass slipper bigger to fit her daughter's foot and stops Cinderella from having her moment of glory. Before wicked stepmother and daughters are wisked away to the palace, she tells Cinderella that she doesn't care what she does, so long as she stays away from the palace. Of course, the magic wand could make that guaranteed, but I guess she doesn't think about that. Anyways, Cinderella sneaks off to the castle so she can find the prince, and a whole bunch of mayhem ensues when she poses as the royal mouse-catcher trying to catch her little mice pals. I should mention that there are songs scattered throughout the film, and they weren't bad, just forgettable. Anyway, I won't go through the whole story. It wasn't as engaging as the original, but it did have its good points, such as Cinderella actually facing a real life-and-death situation, and seeing that both Cinderella and the Prince were willing to risk for their love. The animation wasn't as good as the original, but then it wasn't bad either. Actually, I found pretty much everything here to be pretty much average, except for the story which I didn't like. Besides the obvious plot holes that come into play with having an ultimate magic wand that can do anything, the story felt like it was deleting the original story that we all love. But I'm sure kids will probably enjoy it.